Now these are not my tutorials as the ones below, but a great list from the Back to School Blog Hop - a real keeper. Click here to go see the list after Christine's post. 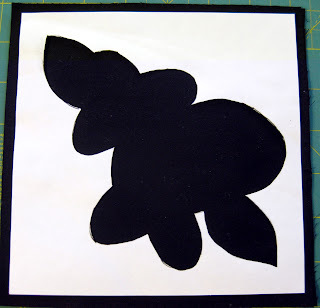 First I make an outline of the template of the applique that I am going to construct. 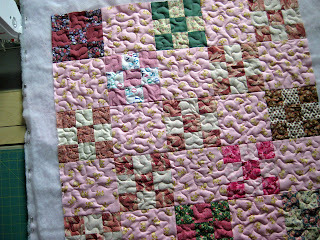 This one is for a 6 1/2" block from the book Better Homes & Garden Easy-Does-It Quilts book. 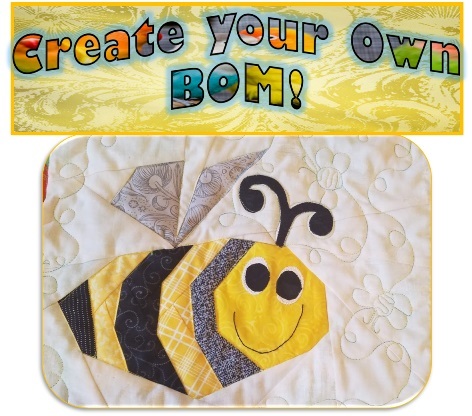 The quilt is called Cosy Comforter and was designed by Peggy Kotek. I numbered the pieces in the order I have to lay them down from the bottom up. Well, I used letters this time. I make reverse copies of my paper pieces. I then iron Steam a Seam (or whatever your favorite fusible is) to the back of my fabric pieces, trace my paper templates to the paper side of the fused fabric,cut out and have them ready to assemble. I then take the outline to my ironing board and lay my teflon sheet over it, and turn on my iron to a non steam setting. 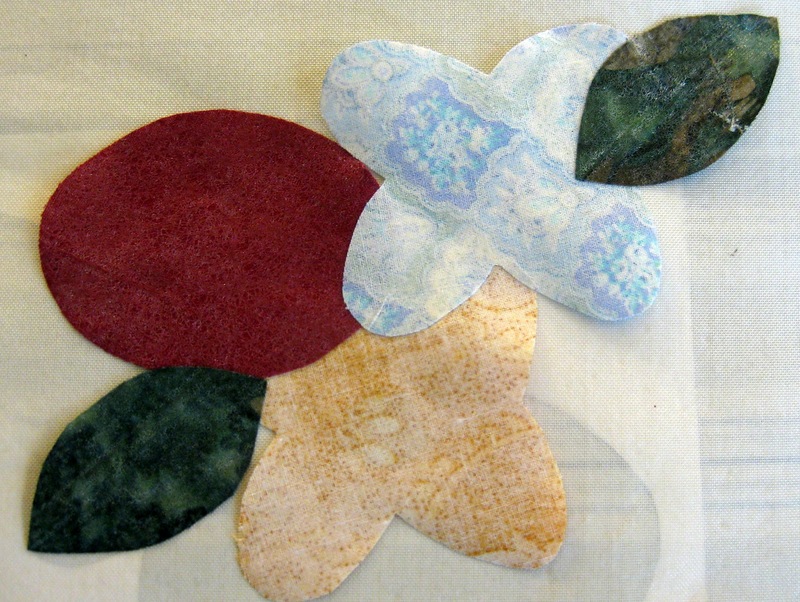 I take off the paper from the fused pieces and lay my A pieces in place﻿. 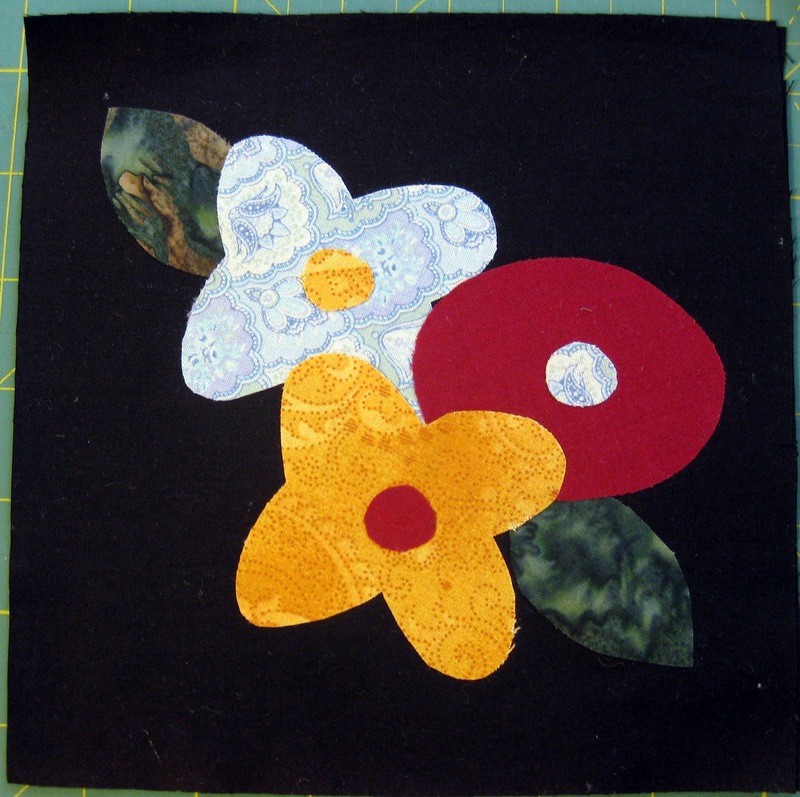 I keep building the applique by added the next piece (B), and so forth.﻿ Nothing is fused yet. 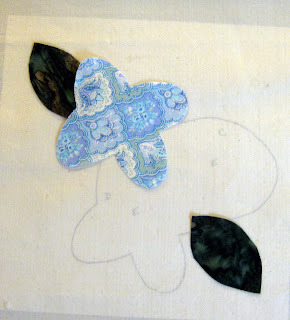 ﻿And I keep doing that til the whole applique is formed. 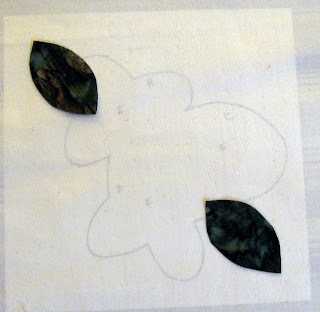 Now is when I fuse the shape by laying the iron on top of the design for about 3-4 seconds. You just want to lightly fuse it together. Now you will be able to gently lift it off your teflon sheet and place it on your background. 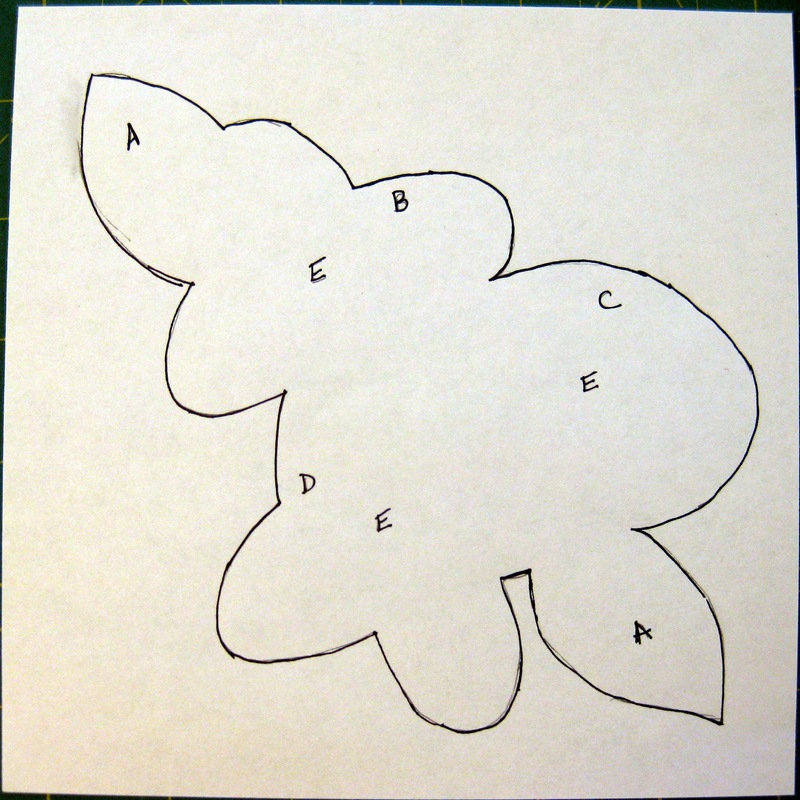 Here is the back of the unit ready to fuse to the background which is now over the outline of your form. 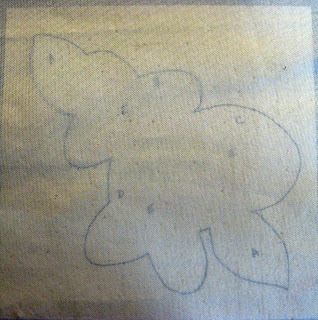 This is what I learned from the Sulky instructor.﻿ And works fine except for dark backgrounds where you can't see your pattern through the teflon sheet. Enter Zena Thorpe. Voilá, my block is done. I have the makings of a new mug rug. I just need to zig-zag, straight stitch or blanket stitch the shape down. PS: When I do straight stitch I wait until the quilting stage to do the stitching down of the applique. 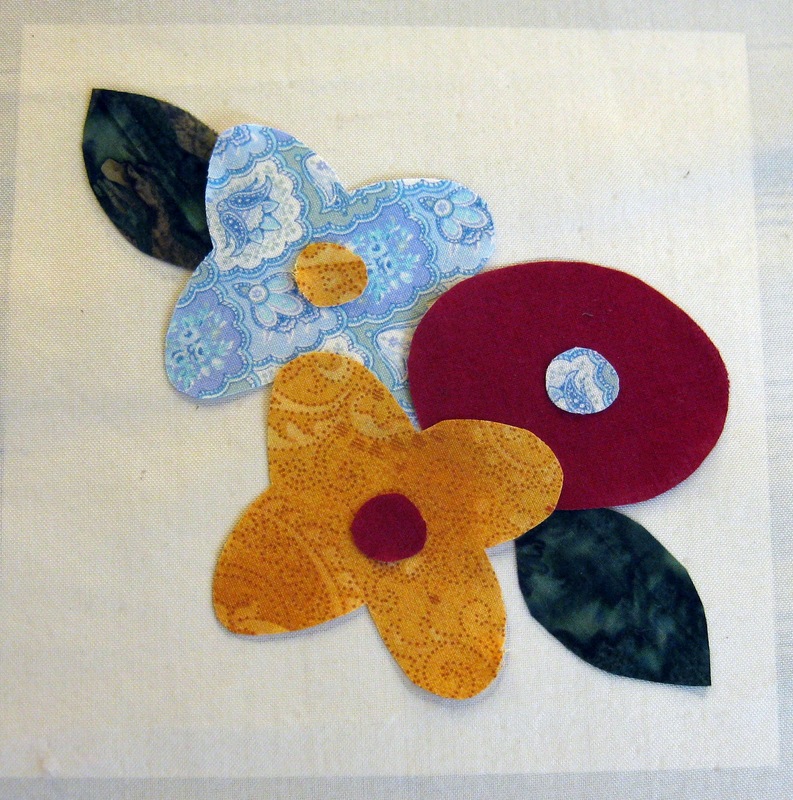 I invite you to join me in making a quilt the quilt as you go way. This will not be the usual QAYG method of attaching blocks with sashing in between them, but where you have more of a solid back. 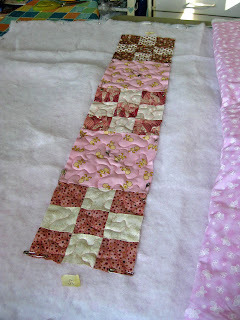 The back will be one piece - not like this one which is one big piece and borders. It won't be this big either, 60x72, as not to discourage you, maybe 30" - 36" square. 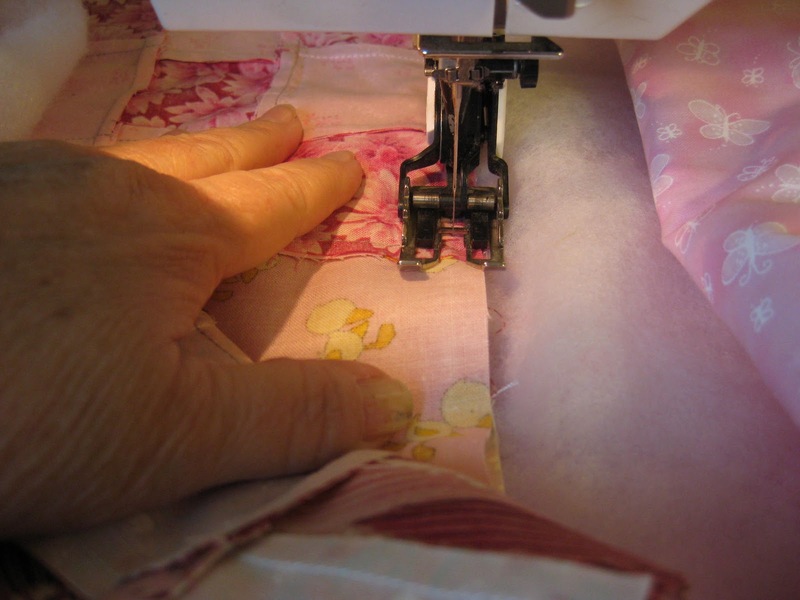 You'll get to practice or try machine quilting. The binding will also be by machine, so that might be new to some of you also. A. 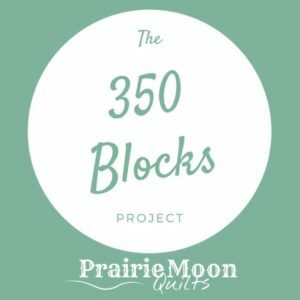 To keep this simple collect 6 1/2" orphan blocks you have in your stash pile. 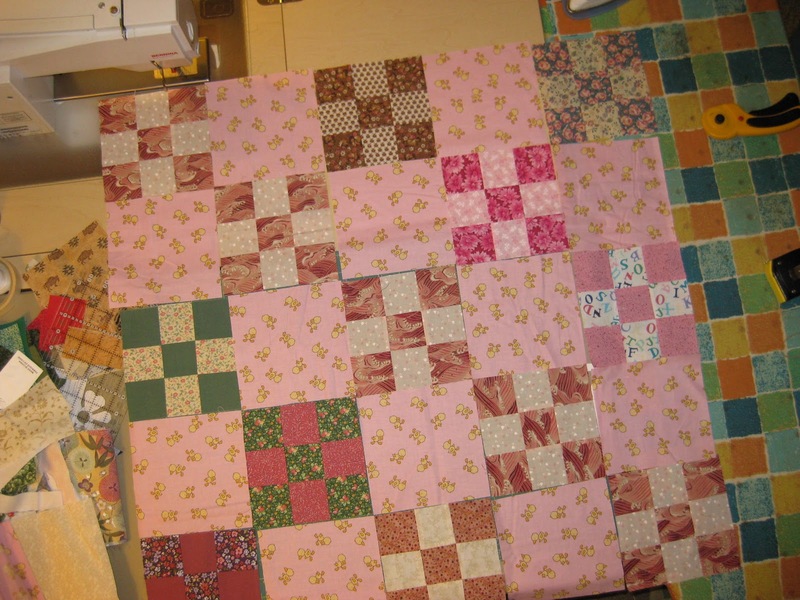 If you don't have any, cut twenty-five 6 1/2" squares from your stash. 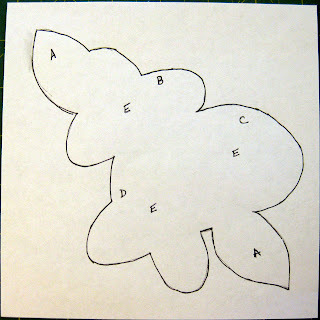 I usually start with one square I like for the center and build a design around that. I sort of did that with my first quilt to tie. For a smaller practice quilt, you can use 9 or 12 squares. B. Once you have your squares, go cut a 38" square of batting and a 38" square of fabric you would like for the backing and would like to bring to the front for the binding. 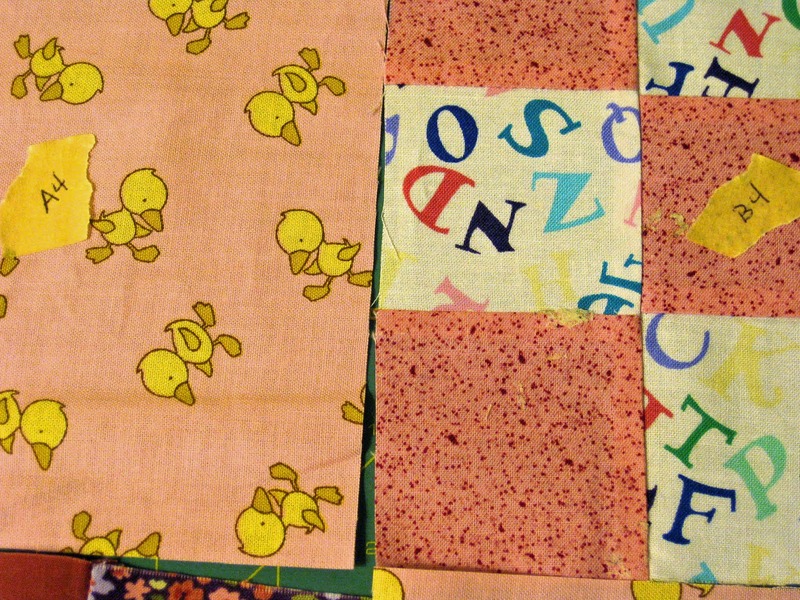 For the smaleer practice quilts you need for 9 squares a backing of 26"x26", and batting the same size. 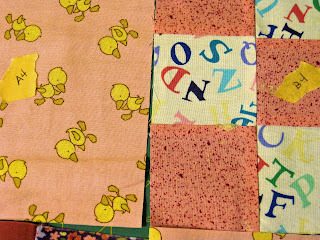 For 12 squares you will need backing of 26" x 32" and the same size for the batting. Once I have my layout, I take masking tape and mark each square with a row and number. This way I keep them in order when I go to sew them. 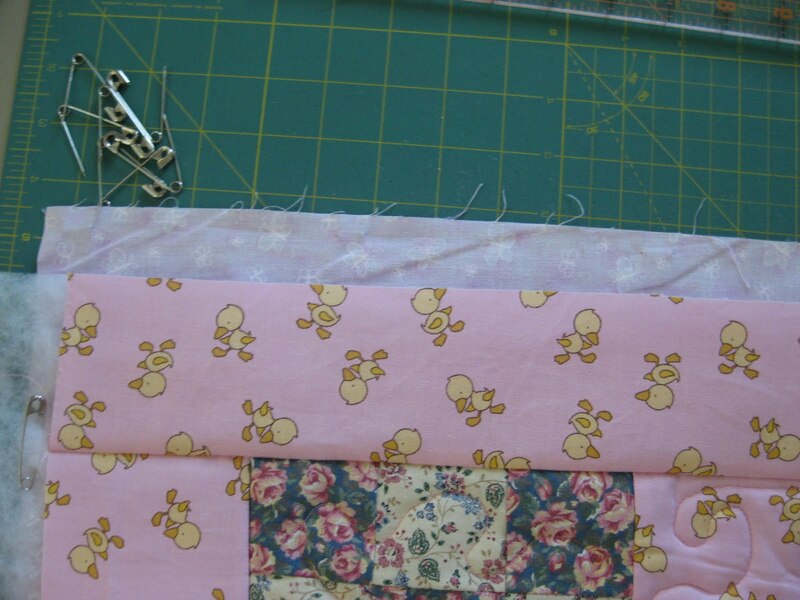 Then I pin one row together so that I can work on one row at a time. 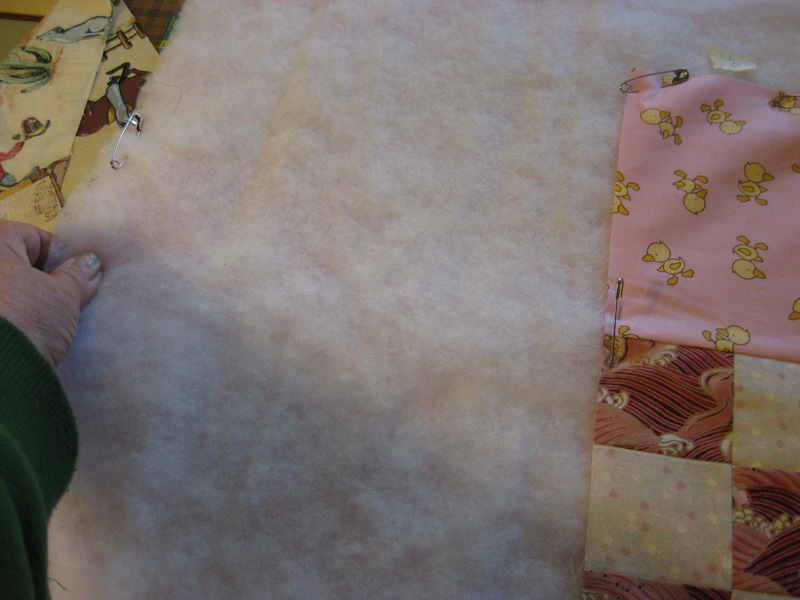 We'll begin with our 38" square of backing fabric. Iron it nicely, fold in half and iron the crease at the outer edge. Do this for both sides. We'll use these small creases to mark the halves of our quilts. Now I laid the back on my carpet with wrong side up. Next I placed my 38" square of batting on top of it. Now I went around the edges with safety pins and pulled the back tight (not taut) through the batting by sticking the pins into my carpet pad. If you use a table to sandwich, you can use painter's tape along the edges of the backing to make it somewhat tight. 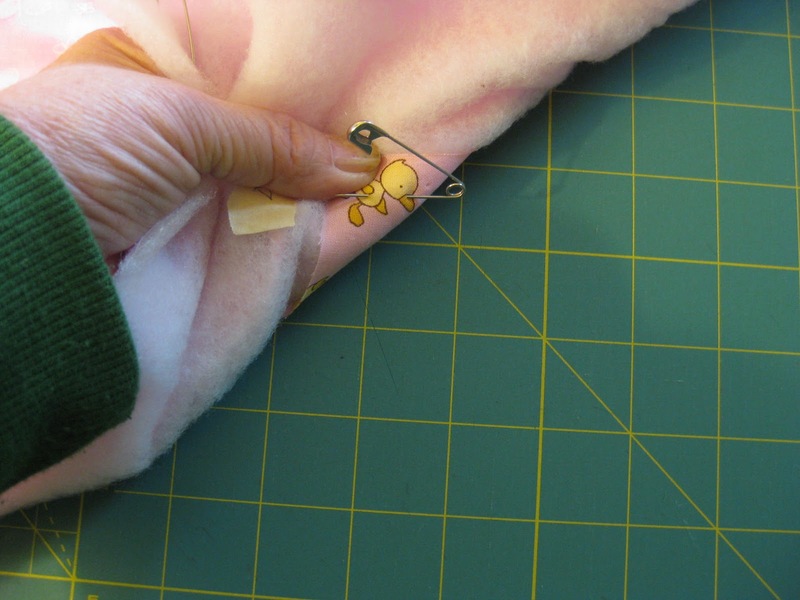 This is an important step to reduce pleating of your back when you are quilting. You can see the pins on the edges. We left room for the border all around. Now pin your row at the corners, along the seams and in the center of the block. 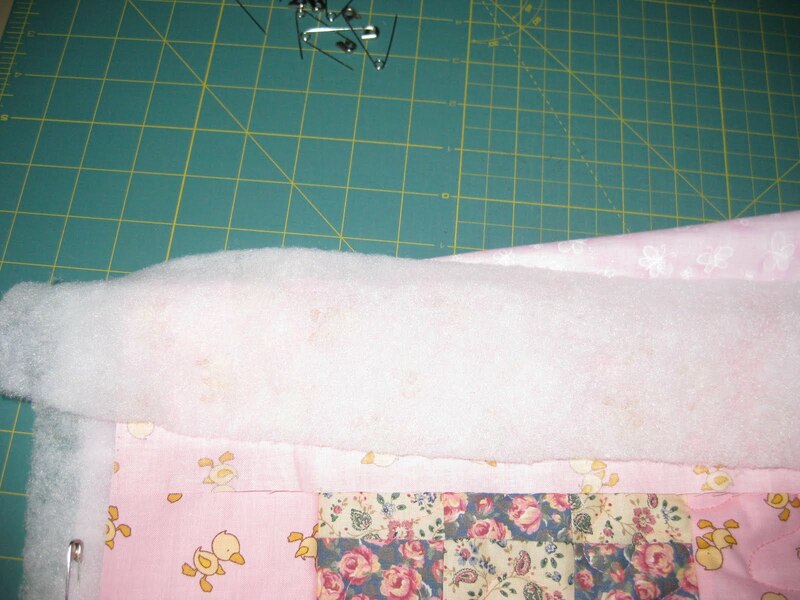 Once that is done, I take out the pins and pin them all around the edges of the quilt to stabilize the sandwich. Turn the sandwich over and run your hand on the pinned back to see it if is smooth. Take your sandwich to your sewing machine. 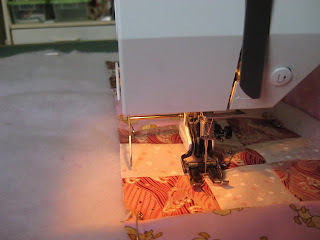 When I quilt, I use the same thread in top and bobbin, a Microtex 75/11 needle, feed dogs down (except for my Bernina 130), a single needle plate, and a open darning foot. 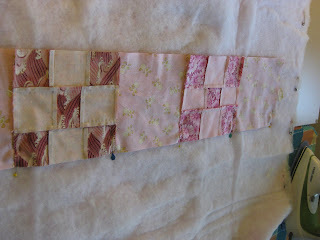 I am going to do a large meander over the row staying about 1/2" away from all the edges. 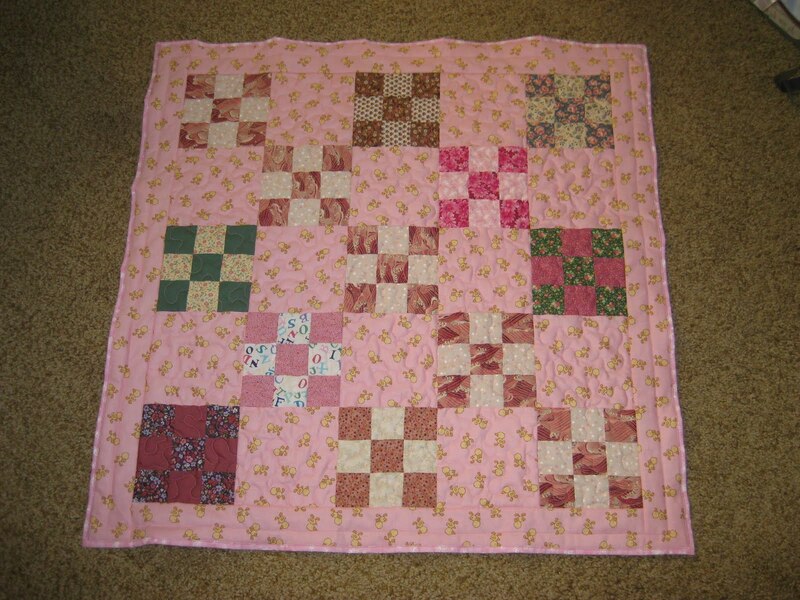 Don't worry - as you add more rows and quilt, you can fill in spaces that may look empty. This is to anchor your sandwich and get the most cumbersome part of the quilt quilted. This will give me straight row quilting. 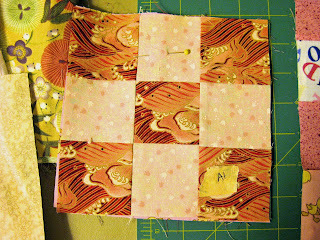 By lining up the guide 1/4: from the edge I get straight lines through all the blocks evenly spaced. Reverse the guide for the other side of the blocks. If you use the edge of the blocks you'll have a nice pattern of spaced lines. Whatever you want to do. With this method all you need to do is two lines and you're done with the row. 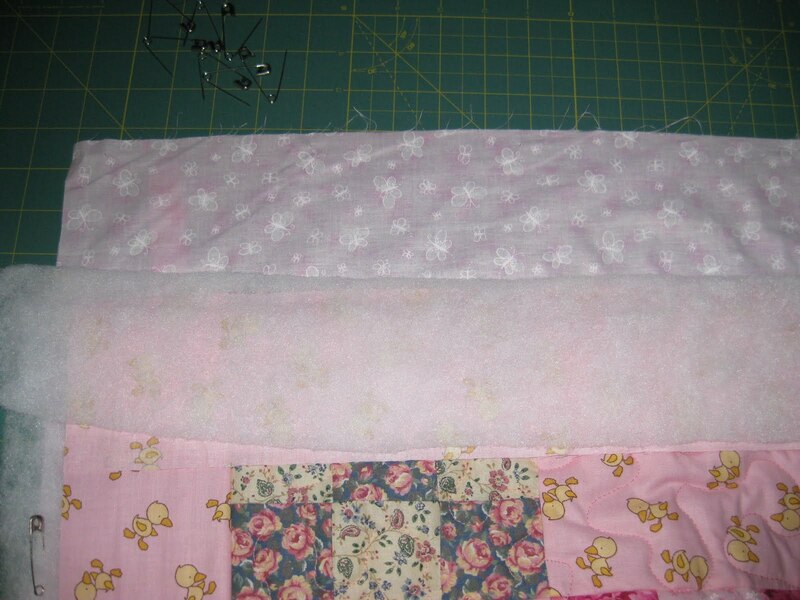 Roll up your quilt on the right side of your row of blocks and place it under the needle. 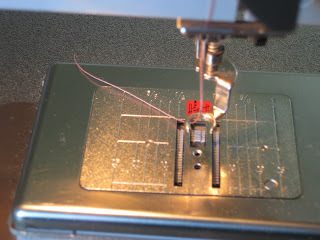 Bring your bobbin thread up to the top, and take a few tiny stitches to anchor your threads. 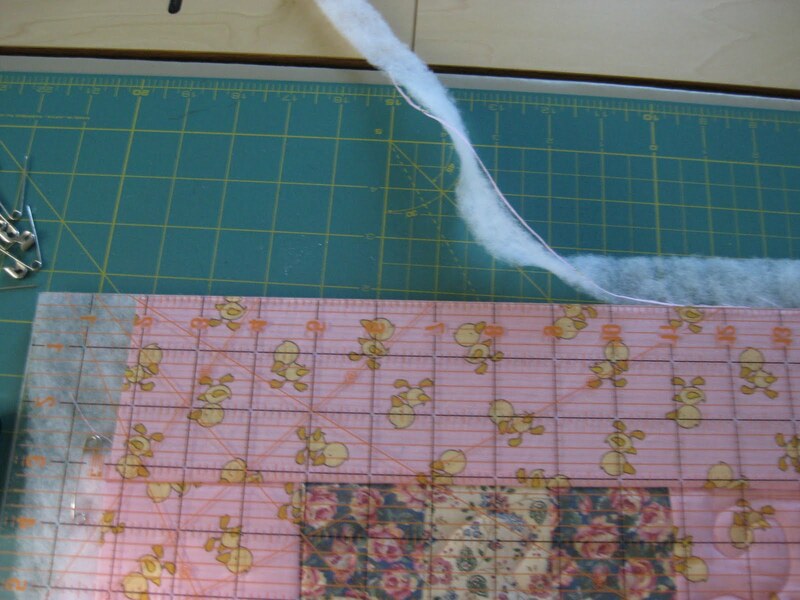 Meander at a steady speed over your block leaving a 1/2" free of quilting on all the edges and guiding the row with your hands. Here is my completed first row - took about 10 minutes. Ps: I put the tape from the top and bottom blocks of the row and stuck them to the batting to remind me which end was up. 1. Take row D and measure its length. Mine was 30 1/2" long. My row C is now 30 1/4" long due to the quilting - Remember when I measured it in step 2 and it was 30 1/2" long? 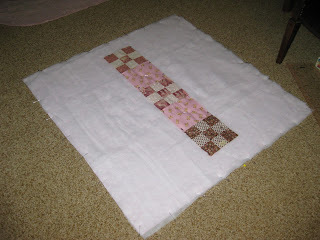 I'll be able to stretch row C (I'll pull on the bottom a little in whatever square needs it.) 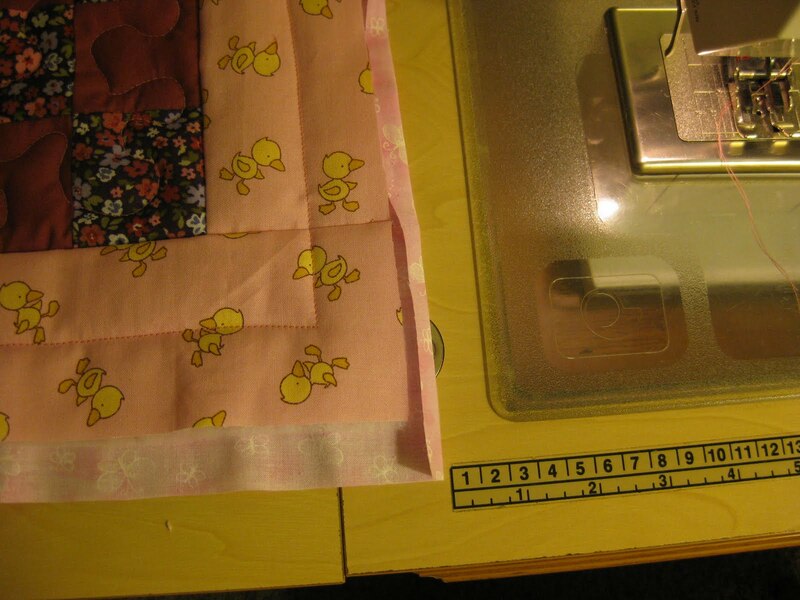 the quarter inch to make the seams intersect and the vertical rows to match. Here is the new row next to the one I've quilted"
2. 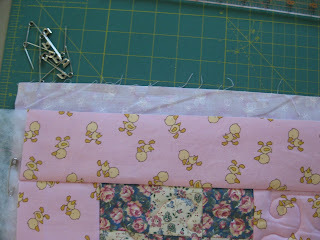 Put the new row wrong side up on your quilted row. 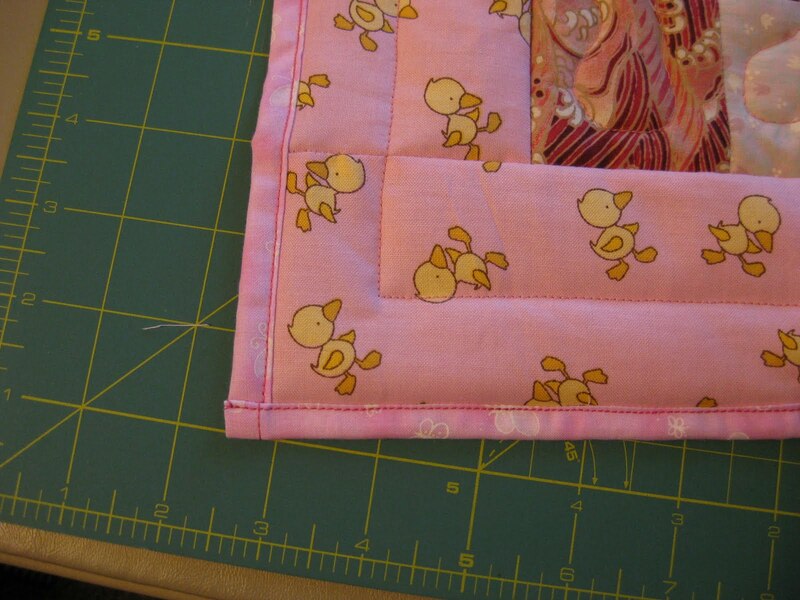 Check that the seams on the row you are adding are pressed the opposite of the first row. 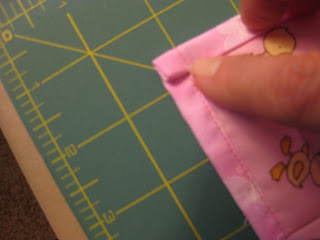 Match the seams and pin. 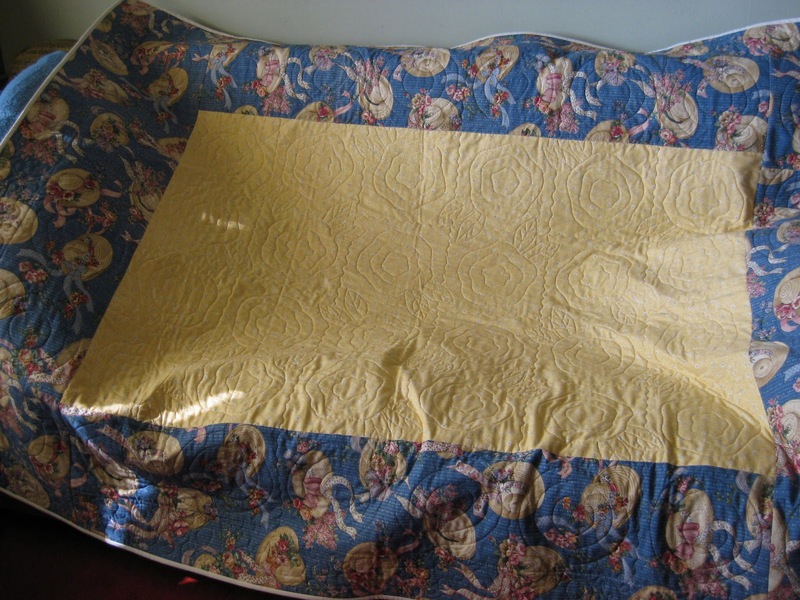 Roll up the quilt on the right side as before. 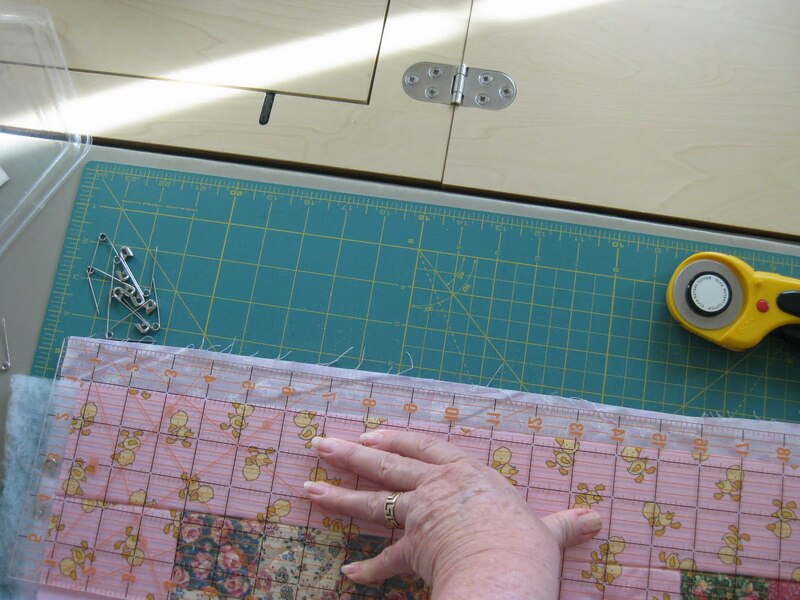 Note: Here is a photo of how I fold the quilt in an accordian pleat (the part that would be on my lap) to make machine quilting easier. 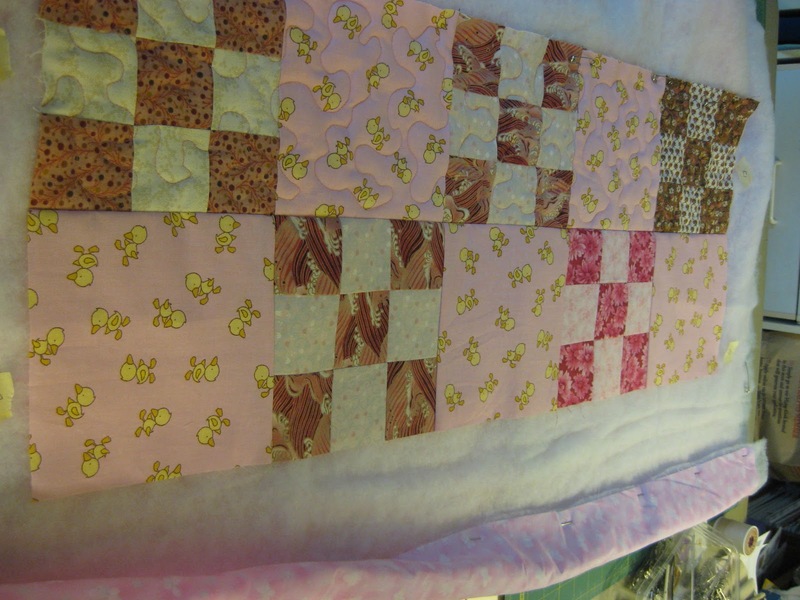 It is weight that makes it difficult to quilt, so try to keep it level on your chest and left side. 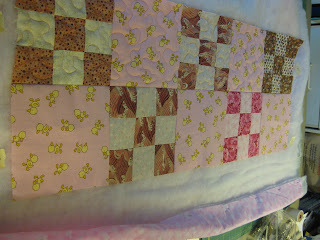 Hanging over the sides makes it harder to quilt evenly. 3. 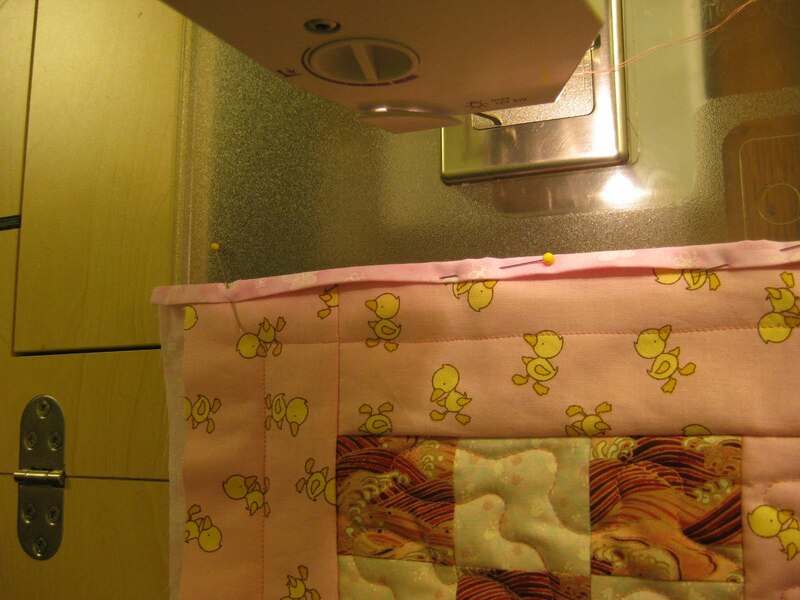 Starting at the top, and using a walking foot, position your quilt to start stitching after bringing the bobbin thread up to the top of the quilt. 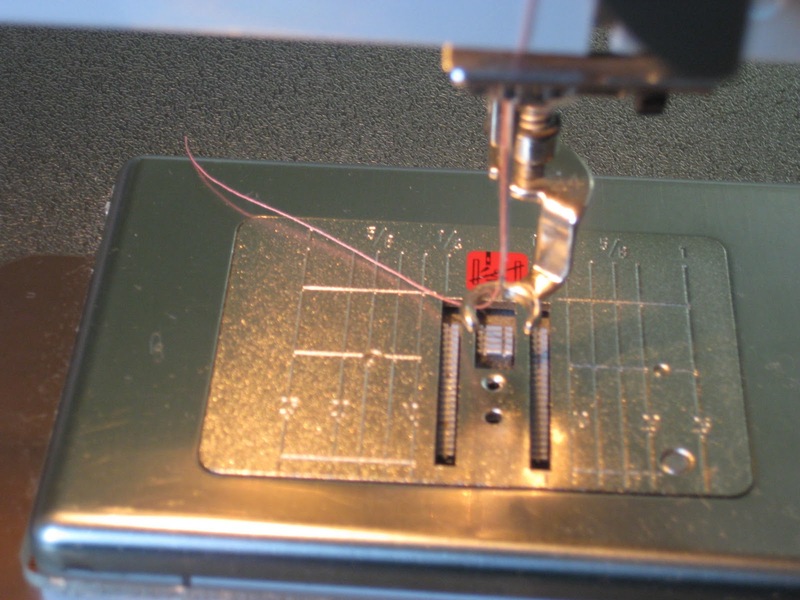 Sew your seam with a steady speed - remember this is a walking foot, not a running foot. 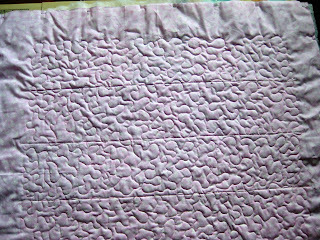 Here is my added second row smoothed over the batting. This will keep wrinkles from forming when you quilt it. Once you've pinned it turn it over and run your hand over where you will quilt. Photo below shows you a wrinkle I found on the back. I remove the pin, smooth out the area and reset the pin. You might have to do a few of these. And when you turn it over, check the front also that it's smooth. Quilt your added row as before. You now have the technique in full. You can do all the remaining rows in the same fashion, just flip the quilt when you are done with the right side, and do the rows on the left starting your seams at the bottom of the vertical row. 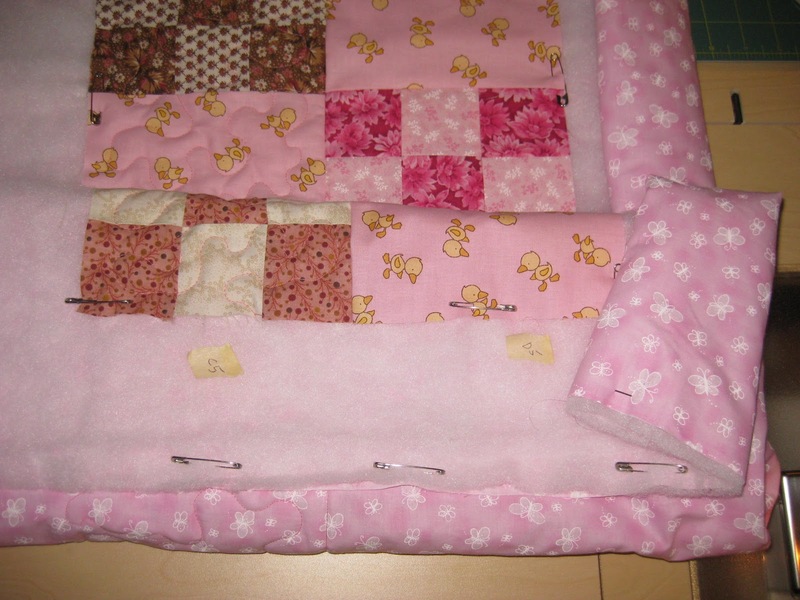 This keeps the bulk of the quilt to your left. ﻿Each block does have some pink in it and I used pink thread to quilt it. It is meandered all over. The next step is to add the border. This is done just as you did the rows. First the two sides and then the top and bottom. 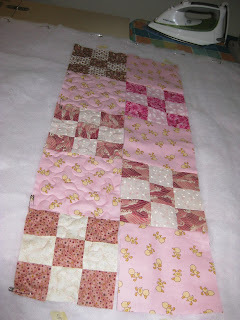 I wait to quilt the borders after all 4 are attached. It is very easy to then do a quilting pattern all around the borders at one time. 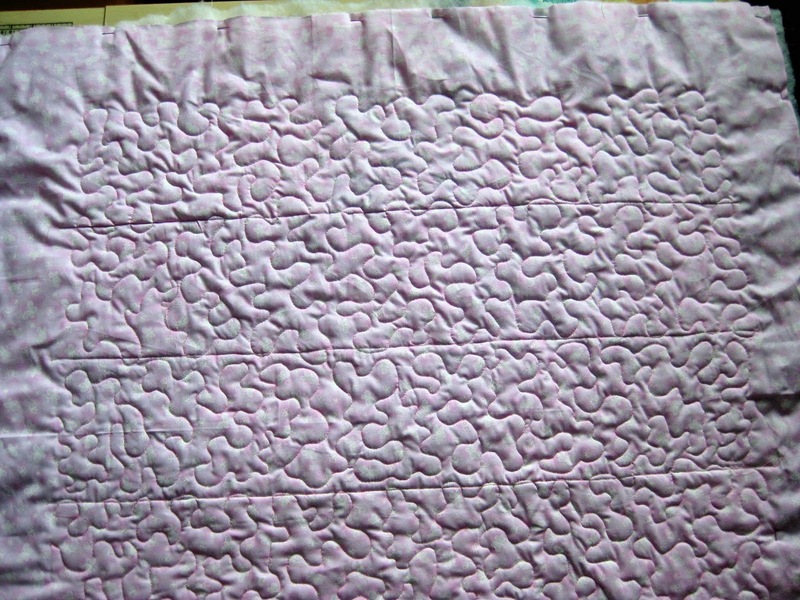 Actually this batting I am using can be quilted up to 4 inches apart. The border is going to be 3 1/2. Maybe I won't quilt it. Step 6: Preparing for last of the quilting. All borders added. Decided since my borders are only 2.5 inches wide, I'm going to do the minimal quilting on them, so I am doing a line half way between the border seam and the outside seam. I'll be using the walking foot for this and the seam guide. 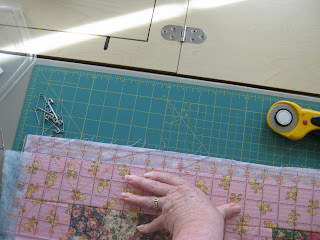 Remove the basting pins of the top border. 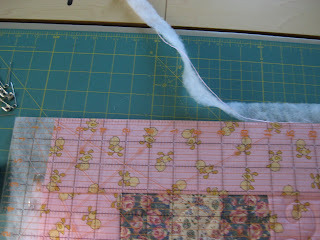 Lay flat on your cutting table the top border of your quilt. Fold the border and the batting over toward you. 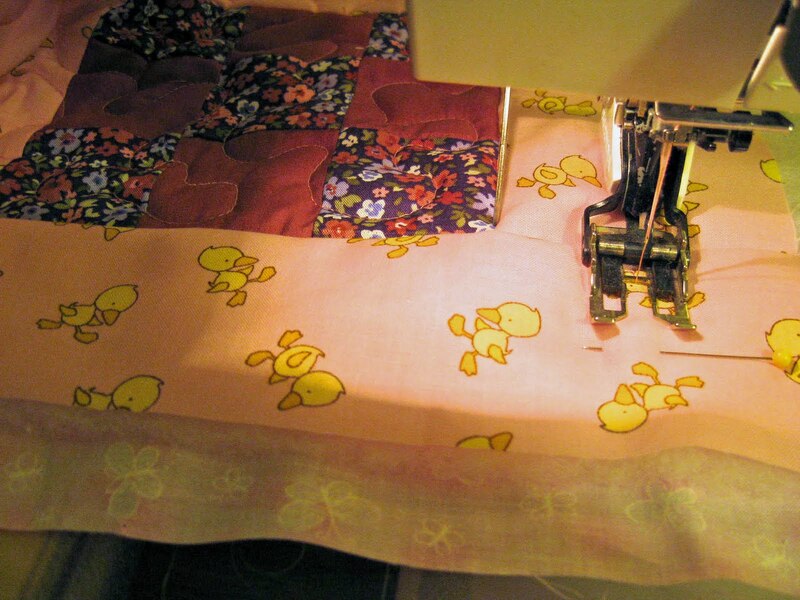 Now fold the back of the quilt under at the seam. You want the backing as far as you can get it from the cutting edge which will be the edge of your border. Fold the front and the batting back up and align the edge of your ruler with the edge of your border. Trim away the excess batting. Now bring you backing up so that it is smooth and is like the photo. 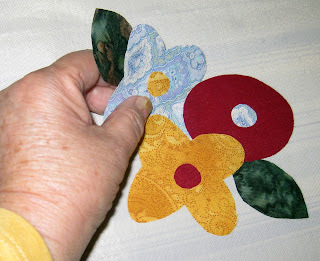 Trim your backing to 1" all across the border. This will be your binding. Do this for the other three sides. Repin your border's edge through the three layers. Step 7 - Quilting the borders and binding the quilt. Using the walking foot and guide, I will quilt around the borders at their centers, marking where the turn will be with a straight pin. Do this for all 4 sides. 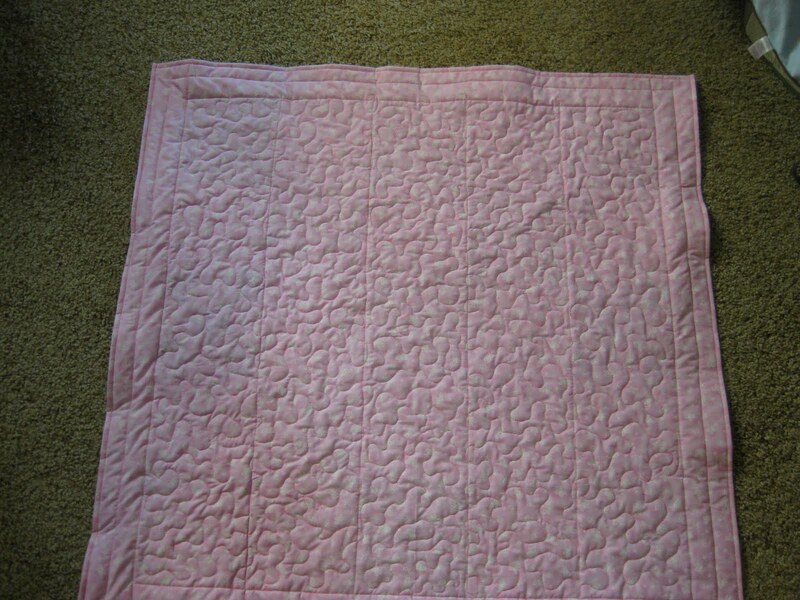 And your quilting part is done. 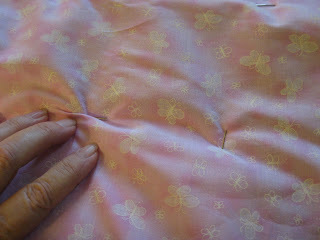 Now fold the back that you left for the binding in half and press. 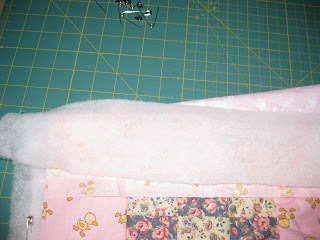 Bring this over for the right and left sides of your quilt and pin in place. Top stitch the binding in place. 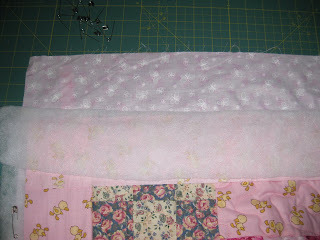 You are now done with your Quilt as you go quilt with a solid back and backing brought forward as binding. 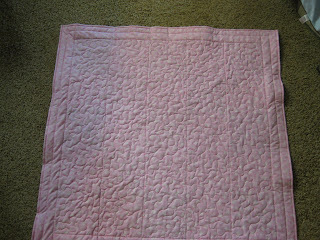 Here's my quilt finished and ready to be gifted to my DGD on her 1st birthday. The curvy sides straighten when washed and blocked.